Inside pocket holds books or small magazines. 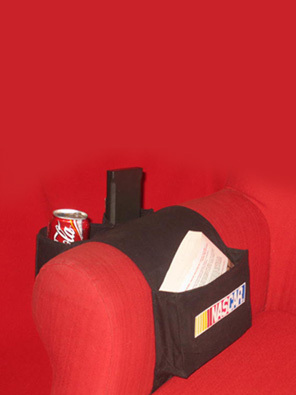 The outside of the caddy has two pockets: one is insulated and holds beverages and the other holds remote controls. Outside pockets have NASCAR driver's names and numbers. Fabric caddy drapes over the chair arm.